June 20 is the summer solstice. Not only does this date mark the longest day of the year, but it also marks the first day of summer. Combine this with the Strawberry Moon and you have a very rare event indeed! How are you going to celebrate the summer solstice? Big Sky, Montana sits at 45.2618° N, 111.3080° W. We are essentially halfway between the equator and the north pole. On June 20 the sun will rise at 5:37 AM and set at 9:17 PM. The Old Farmer’s Almanac writes that the length of daylight on June 20 is 15 hours 39 minutes. Compare that to the shortest day on December 21, which is only 8 hours 45 minutes long. That’s a big swing! According to TimeandDate.com, at the summer solstice, the sun’s “zenith does not move north or south as during most other days of the year, but it stands still at the Tropic of Cancer. It then reverses its direction and starts moving south again.” This is the point where Earth is farthest from the sun. Learn more about the Summer Solstice here. The Summer Solstice is an annual event, but this year the North American summer solstice will also be marked by a full moon called the Strawberry Moon. The June full moon was referred to as a Stawberry Moon by early Native American Algonquin tribes. This is because it marks the start of the season of strawberries. The Summer Solstice and the Strawberry Moon occurring on the same day is very rare. It last occurred in 1967 (aka The Summer of Love) and will occur again in 2062 according to EarthSky.org. This may be a once in a lifetime event. From this point on the days will get shorter until the winter solstice on December 21, 2016. As the days get shorter, we are that much closer to ski season again! But until then, we have an entire of summer of fun ahead of us. Big Sky is the ideal place to play on the longest day of the year. Hopefully you got outside and enjoyed the perfect June weather. Maybe you went hiking, climbing, rafting, or biking? 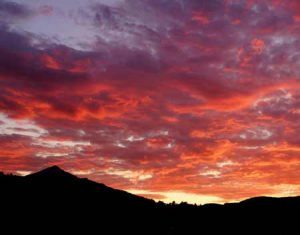 Now that it’s officially summer Big Sky kicks things off this week with the first Big Sky Farmers Market and the first Music in the Mountains free summer concerts. Summer is finally here and we’re excited!